Day 7 was actually the day of our return, back home to Rijeka, but we didn't travel until the night time! We actually took almost the last ferry to the Mainland! We just didn't want to go back to the "reality"! Rab was just too beautiful, and there I was in touch with my roots and the past...My parents lived there until I was 3 or 4 years old, so my very first memories and my very first friendships come from this island! This year, as my Dad is no longer on this Earth, it was so emotional for me, going back to Rab. I visited some of his best friends and felt like he was there with us for a moment! I also re-discovered an old, forgotten friend of mine! He was my very first friend, and we always played together...but I was 2 then, and he was maybe 4...so of course I would have never recognized him on the streets if I saw him! Too many years have passed since our childhood games at the island! My Dad's friends told me where he works, so I went to give him a surprise visit, after almost 30 years!!! I met some really loving people there and I felt as they're my long lost family! 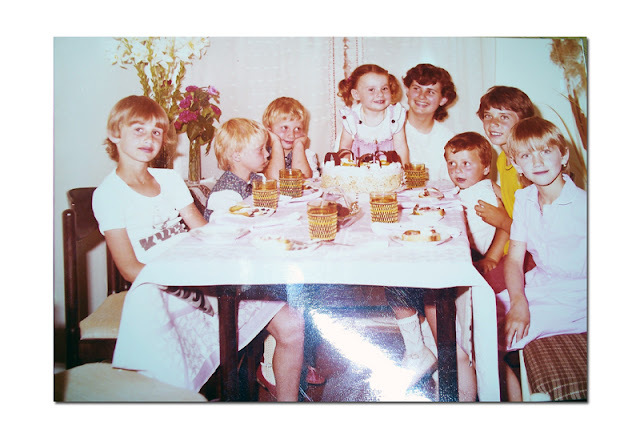 I'll include one pic from my album, when I was celebrating my 2nd birthday, back in 1983. at the island of Rab, with my "crowd" from there, my oldest friends! B-day girl & my friends from Rab! As you can tell from my story, our last day at the island was really intense as we did so many things starting from the very first morning! In the afternoon hours, we went to the beach, to catch at least a few hours of sun, before hitting the road...of course, we got tired playing volleyball, but after a quick shower and a yummy dinner, we were ready to say goodbye to Rab for this year! There is a bear on the island!!! 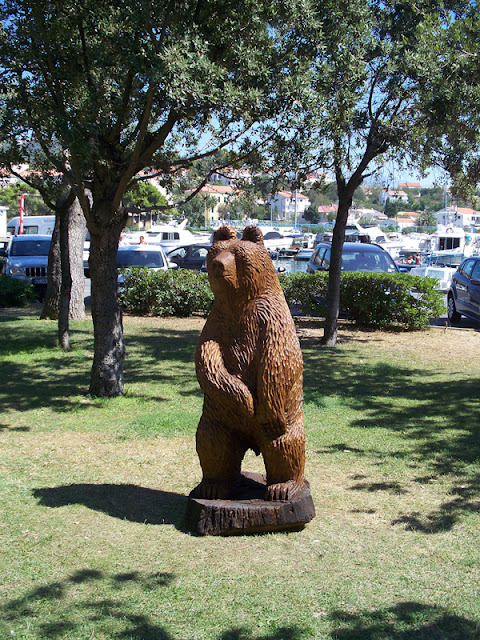 Of course, there are no bears at this island, so maybe the people from Rab fancied hhaving one...even if it's just a wooden statue! I like to accessorize even when I'm at the beach! My lace dress is perfect for summer & going to the beach! I got it at my local thrift store, I believe the brand is Oviesse, and it was brand new, with an original price tag still on! Sunnies, bathing suit, necklace and flip- flops are from H&M. Beach bag is Juicy Couture. Oh yes, I have to mention, no Outfit of the Night pics on my Day 7, as we were travelling back home! It was past Midnight when we arrived home, but we prefered it like that, because we had a whole one day left to enjoy the island, before the departure! I hope you enjoyed this Holiday Outfit Vlog series! Leave me a comment if you did! Which one, out of the all outfits featured in my vlogs, did you like best? Bok! ;) I'm so glad I found your page. I love your fashion and really look up to your sense of style!! Oh I forgot to say I am also Croatian. If you have time it would mean the WORLD to me if you looked at my page, I just began a few months ago. Food & Health: Grocery Haul! New Vlogs on MissFashionKitty Channel! August Fashion Favourites & My Beach Must- Haves! SUBSONICA 2012. TOUR: Yesterday's Concert! THIS IS GOODBYE? CHANGES, CHANGES, CHANGES! Holiday Outfit Vlog # 6 Maxi Dress! Holiday Outfit Vlog # 5 Trendy Romper!